PORTLAND, Ore – Today, Oregon Wild announced the publication of new trail images in Street View in Google Maps, through the Trekker Loan Program. These new panoramic images were collected by staff and volunteers earlier this summer using the Google Trekker equipment. The Trekker, a 45 lb backpack with a camera array that can capture imagery in 360 degrees, functions much like a portable Google Street View car. Google loaned the Trekker to Oregon Wild, who took it into some of the most remote locations in Western Oregon, offering a view of some of the state’s more obscure national public lands. “Oregon is famous for its gorgeous views and landscapes,” said Deanna Yick, Google Maps Street View Program Manager. “Now, these places are available for everyone around the world to see right in Google Maps, and be inspired to visit in person. Loaning our Trekker equipment to Oregon Wild was the best way to create a virtual experience of these remarkable places." Many of the locations Oregon Wild visited have either been directly threatened by new roads and logging, or by nearby logging proposals that affect them. For example, the featured Fall Creek area running through Salem District Bureau of Land Management (BLM) lands borders private timberlands that are routinely clearcut. 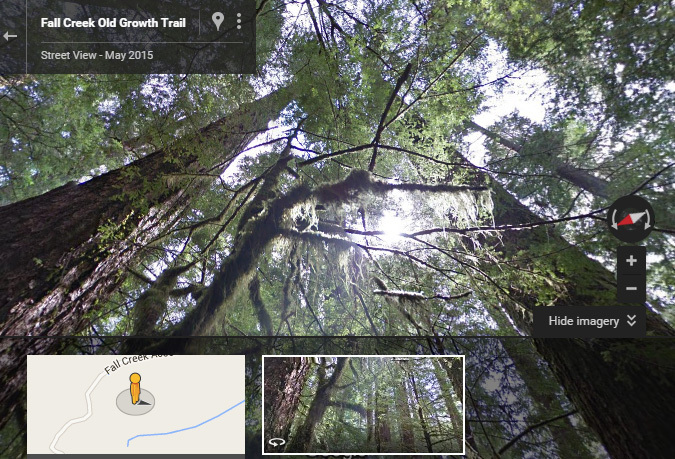 The images captured by the Google Trekker showcase a hike through a beautiful forest, but it is an island of old growth in a sea of industrial tree plantations. As a result, animals throughout Fall Creek, like mountain beavers and slender salamanders, are cut off from other populations. The Crabtree Valley, which features 500 year old Douglas­fir, hemlock, and cedar trees, sits amidst a spider­web of logging roads and at one time was private timberland slated to be logged. After numerous efforts by Oregon Wild and others in the 1970s to protect this area, the property was finally traded to the BLM and designated as an Area of Critical Environmental Concern for its ancient forests and wet meadows, but it is surrounded by clear­cut forestlands. Green Springs Mountain, another featured route with the Google Trekker, is an important area for native plants and wildlife like Lewis’ Woodpecker, Northern Spotted Owl, and Pacific Fisher. Scientists have urged that the area be protected as an addition to the Cascade­Siskiyou National Monument. Unfortunately, the BLM continues to pursue plans to create new roads into this sensitive area.